Verandah is a courtyard-themed restaurant in Punjabi Bagh with rooftop seating, green interiors, and comfort food from all over the country. We went to Verandah, and while it was too packed for a clear view of the whole place at once, it does show promise—especially when it comes to the rooftop. 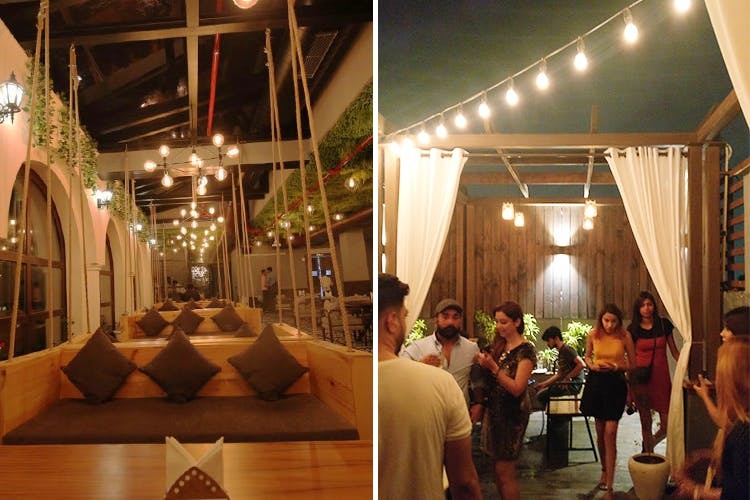 Sipping cold beer on a clear, breezy evening, surrounded by potted plants and hanging yellow lights is the sort of chill plan the rooftop is perfect for. The indoor area has swings for seats, vines on the ceiling, and ever-so-loud speakers for when you want to get those feet tapping. The food we tried was mostly appetisers, like fish and chips, chicken tikka, and some cheesy bread, but we hear there are options like Kerala-style Tandoori Prawns, Sago Popcorn, Chinese Dosa, Bombay Mava Cheesecake and more–we definitely want to try these out. We're also looking forward to try out their fusion cocktails like Khallakhatta LIIT, Aampanna Daiquiri, Spicy Cuba Libre, Vodka Narangi, and Tangy Cosmopolitan. The lighting in the indoor area could be brighter. Finding parking might be a task—we say you take a cab to reach here.